This traditional honey cake contains only two tablespoons of oil, but honey, coffee and spices make it satisfying and tasty. This recipe makes two generous loaves. I serve one on Rosh Hashanah, and freeze the second for dessert before the fast of Erev Yom Kippur. Wrap the cake carefully and it will keep well for a few days, depending on the climate. I’ve included instructions for mixing by hand, or in the food processor. From Jewish Cookery by Leah Leonard. In a bowl:Beat eggs with sugar till combined and stir in salad oil till smooth. Mix dry ingredient, stir in the egg mixture alternately with the honey and coffee combined, till smooth. Then stir in the nuts. The batter will be fairly soft and easily stirred. Turn in to a well-greased and floured round cake pan or two loaf pans and bake 50 minutes at 325 F (160 C.). In the food processor: (Method adapted from Norene Gilletz, Pleasures of Your Food Processor, for Honey Cola Cake.) If using nuts, process and remove to another bowl. Mix the dry ingredient using the steel S blade for about ten seconds, until blended. Empty into another bowl. Process sugar and eggs for 30 seconds. 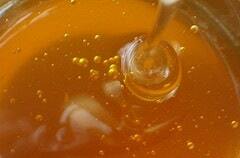 Add honey and oil, process for another 1-1/2 minutes. Remove cover and add dry ingredients. Pour coffee over and process with 4-5 quick on/off turns, just until batter is blended. Add nuts by hand. A-H: I prefer this over the spongier kinds, but if you like very moist I would look for a different recipe. Is adding sugar really necessary if there’s a cup of honey? My husband doesn’t like his cakes too sweet, so I’m usually more than happy to reduce sugar whenever at all possible. Mrs. T., thought I had replied. You can definitely cut the sugar significantly. Not sure about leaving it out, though. I’ll give this a try, hope it’s not to dry. Allways a challenge to cook low fat.